Constructed from 4” x 2” RSC fully welded with front standing plate and ‘A’ frame drawbar. Single Avonride torsion beam axle and fitted with 200 x 50 Auto reverse brakes on 4 stud 5 ½”pcd hubs. 2 No 185 x 13 x 8 ply radial tyres fitted to 4 stud 5 ½” pcd rims. Knott 2000kg capacity posibrake over run auto reverse coupling c/w Spring assisted handrake lever, breakaway cable. Fitted with 40mm ring eye or 50mm ball. Moulded mudguards, rear support stand, telescopic front jockey wheel, full road lighting c/w 7 pin plug. Cylindrical in section with removable top section for tank access. 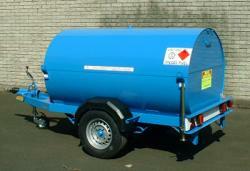 Rear access door, fitted with stainless steel hinge and fully lockable.Bund contains 110% of inner tank. Constructed from 304 stainless steel with a capacity of 1000 Litres. 2”filler with cap & chain. 1”vent valve, ½”. P.R.V set at 2psi in tank top. Bottom outlet valve with secondary in line. COMPLIES WITH STATUTORY INSTRUMENT 2001 No.2954 THE CONTROL OF POLLUTION (OIL STORAGE )ENGLAND.